Status: This is a Nation Record Status & Rose Awards Tournament. It is a closed shoot for EMAS county teams only; individual entries will not be accepted. Round: Male archers will shoot the York Round; female archers may shoot the Hereford Round. Date & Time: Sunday the 6th September 2015; assembly 09:15 for sighters 09:30. Archers not registered before assembly will not be allowed to make up any ends they have missed. Venue: Bramcote Archery Club, Moor Lane, Bramcote, Nottingham NG9 3GA. Access is at the end of Moor Lane Via a Bridle path, Please beware of Pedestrians and Cyclist. Team Entry Entries must be made on the entry form provided to the tournament organiser by the 31st August 2015 with a valid payment of £10.00 per archer to the East Midlands Archery Society. Entries may be adjusted up to the closing date, substitution of team members may be made up to assembly. 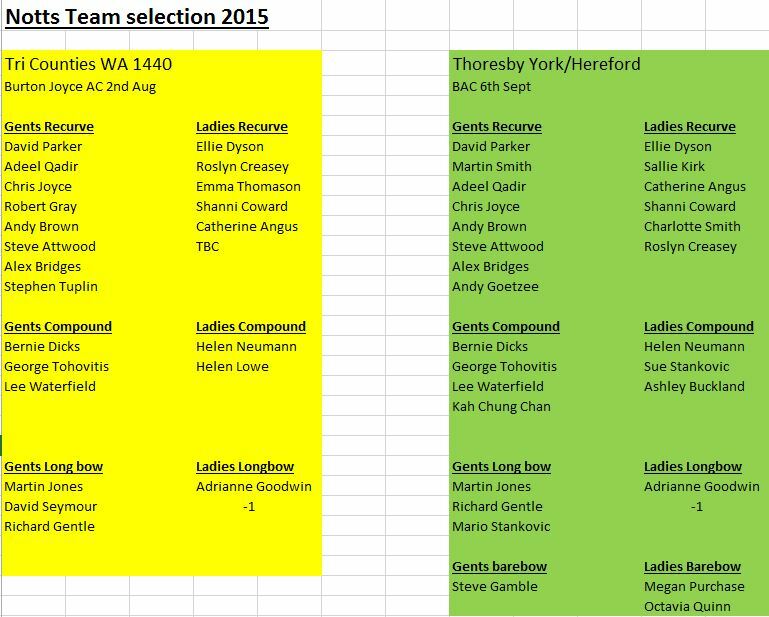 Awards: Thorsby Trophy Recurve Team – 8 Male& 6 Female 6/4 to count respectively. 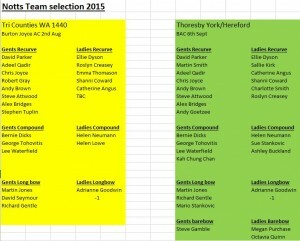 Bradgate Trophy Compound Team – 4 Male & 3 Female 3/2 to count respectively. Boat Trophy Longbow Team – 3 Male & 2 Female 2/1 to count respectively. BareBow Team – 3 mixed 1 Male &1 Female to count respectively. Maid Marion Trophy – Highest Scoring Female Longbow. Robin Hood Trophy – ?? . Individual medals for male and female competitors in each bow class. . Photography: Photography & image recording – the recommendation in the GNAS Protection of Children & Vulnerable Adults Policy will apply. All persons wishing to make recorded images or video have to register with the tournament organiser on the day. Drugs Testing: This Record Status Shoot will be liable for drug testing; competitors approached to give samples must comply, as refusal will be treated as a positive result. Parents or carers of competitors under the age of 18 must sign the permission slip giving consent to a drug test if required. Registration: GNAS Membership cards must be shown on registration, competitors may only shoot with proof of membership and affiliation to the respective county. Target list and results will be published on http://www.emasarchery.co.uk/. Facilities: Light refreshments will be available throughout the day. Disclaimer: The East Midlands Archery Society; Bramcote Archery Club and their respective volunteers staging this shoot can not be held responsible for any injury, loss or damage howsoever caused unless proven to be due to their negligence.